I have been applying myself to the k2, p2 rhythm of Nan’s jumper, with its even rib and repetitive motions, for the last few evenings. It is fantastic television knitting, not requiring concentration or heavy application of the mental faculties, it leaves the brain free to wander over to what is flickering away on that big box of lights, watching the new political make-up of the UK unfold, refold and change its mind before pretending at happy families with the UK at large. It’s not very engaging, though, for when you want to sit down and create, and watch a pattern unfurl itself from a pile of numbers and abbreviated terms into something surprising and wonderful. 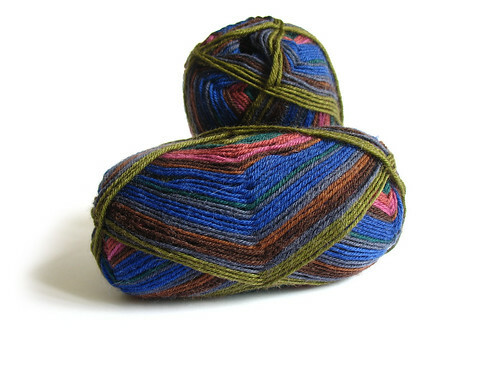 So, because I am weak-willed and too easily distracted, I have cast on for the aptly-named Diversion socks, from Knitty. 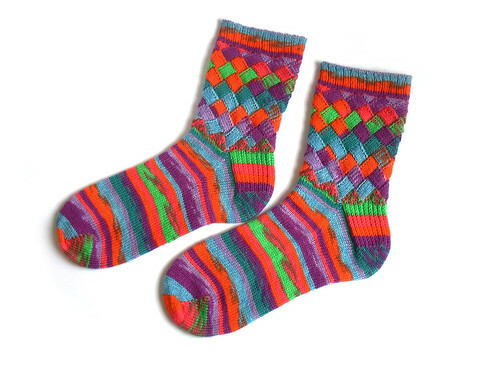 Like many of my knitterly friends in the UK, I was tempted in the Kemps sale of a few months ago to part with some hard-earned electronic money in exchange for some sock yarn by Kaffe Fassett for Regia. At £1.20 (or thereabouts) per skein it was too bargainous to pass up. Since first using Regia’s Kaffe Fassett self-striping yarns I have been searching out patterns which employ various ways of using the stripes to create different effects. 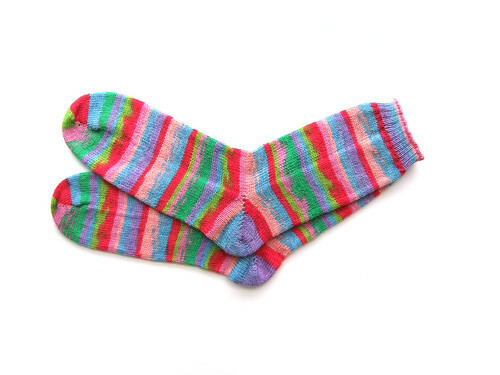 The first pair of socks I knit were one of Kaffe’s colourways ‘Zany: Easter’, if I remember rightly, and I knit a very vanilla pair of socks and just let the yarn do exactly what it had been designed to be – be all ‘Kaffe’. 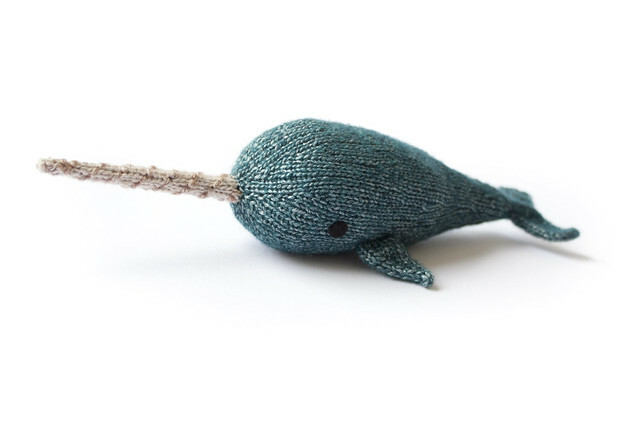 The next time I turned to this line of yarns for its ‘let me take care of the colour changes for you’ convenience I knitted Lucy Neatby’s Mermaid Socks, which has been re-published in Issue 4 of The Knitter magazine. This pattern allowed the stripes to become fractured in a stepped spiral down the leg and along the foot to the very tip of the toes. 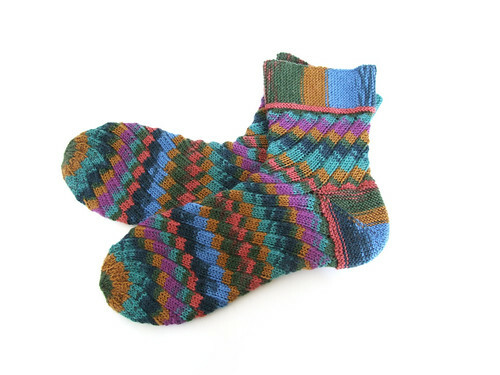 My most recent Kaffe-a-thon resulted in the extremely involved Harlequilt socks, from Sandy Beadle’s Annetrelac Socks pattern, which this time used and entrelac-in-the-round technique to utilise the stretches of colour in yet another variation of stitch and technique. I have a few more patterns lined up for future uses of my Kaffe Fassett yarn, each employing the stripes in different and interesting ways, for when I need a diversion from other projects-on-the-go.